Spanning some 640 square miles, Skye is second only to Lewis & Harris among the largest islands in Scotland. 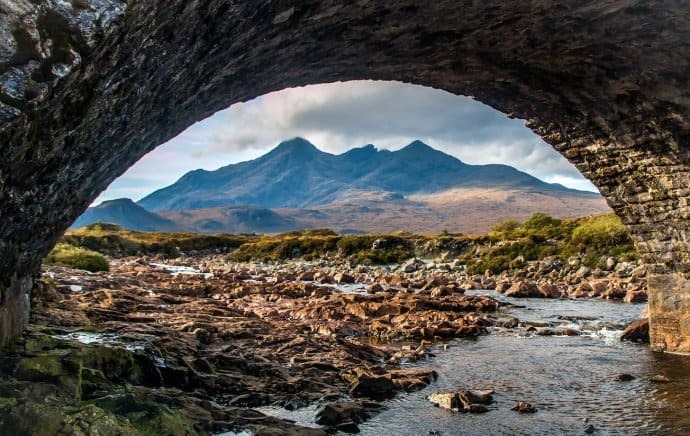 So perhaps it’s no surprise that there’s a diverse array of things to do on the Isle of Skye, with activities geared towards nature lovers, outdoor adventurers, foodies, and families. The problem is that, during the peak summer months (June through September), there are too many tourists looking to explore the “Misty Isle.” Overtourism has become a huge problem in recent years, due partly to the popularity of the TV show Outlander and a recent music video shot there by One Direction’s Harry Styles. According to Visit Scotland, more than 150,000 people visited Portree (Skye’s largest town) in 2016, many of them cruise passengers stopping in for a day. That’s an awful lot of tourists for an island with just over 10,000 residents. The negative impacts of this mass tourism surge include traffic jams, accidents, and environmental degradation of the island’s renowned natural attractions. Locals are also having an increasing difficulty in finding affordable housing, due to the sharp rise in AirBnB rentals. By the time we visited in late September, the crowds had died down a bit. Yet pristine places such as the Fairy Pools and the Quiraing were still bustling with tourist activity. The road to Skye’s southern coastal port at Elgol is long and mostly narrow single-track. Thankfully we saw very little traffic along the way. And the tiny town is more than worth the trek, just for the picturesque panorama it provides of the nearby islands. We were there for the AquaXplore excursion with Bella Jane Boat Tours. The morning skies were gloomy as we pulled on our rain gear and piled into a RIBS (Rigid Hull Inflatable Boat). But, with only 10 people on our boat and no other boats around for miles, it was a welcome break from the crowds on Skye’s popular Trotternish Peninsula. 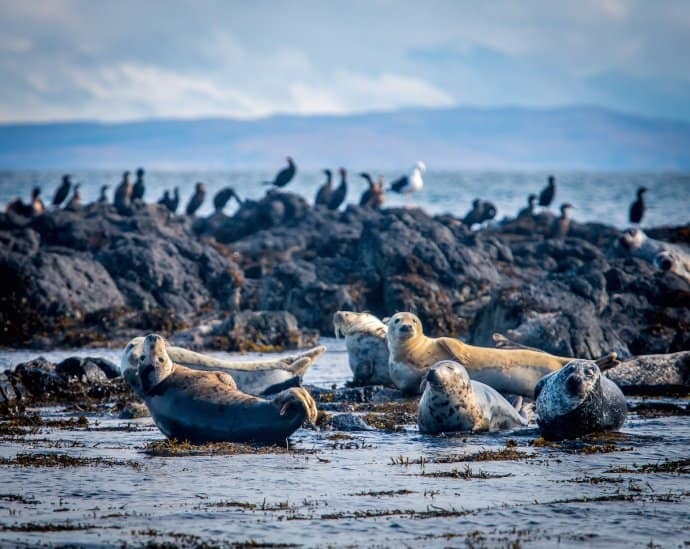 The wildlife-watching tour visits the coast of Skye as well as smaller islands nearby, such as Canna, Eigg, Rum, and Soay. Fortunately the skies began to clear as the morning wore on. As the sun broke free from the clouds, we were treated to a vivid double rainbow over the water. Unfortunately, we were too late in the season to see Puffins. But we were treated to a host of other awesome animal sightings. There was a pod of Dolphins leaping in the wake of our boat, Sea Eagles soaring in search of prey, Seals sunning themselves on rocks, and two huge herds of Red Deer grazing along the Rum shoreline. Even without the wildlife, the tour would be worth it just for the dynamic coastal scenery. Afterwards we had an excellent lunch at the Elgol Shop (which is also home to the closest restroom). It’s a lovely way to spend the day far off the usual tourist track. 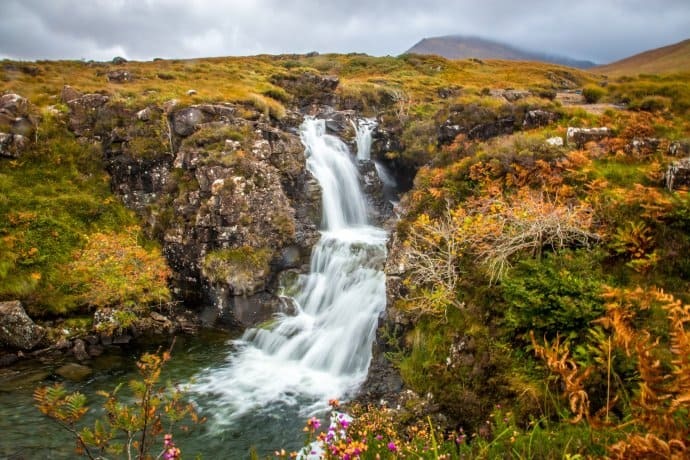 The Fairy Pools– a series of gorgeous waterfalls and pools near the small town of Glen Brittle– has emerged as a poster child for Skye’s growing overtourism problem. According to our Rabbie’s guide, Arron Uytendhal, it all started a few years ago when a photographer won a major contest with his stunning image of the Fairy Pools. Visitor numbers skyrocketed the following year, drawing hundreds of people every day to a site that only offers 30 parking spaces. We saw dozens of vehicles parked along the roadside, causing congestion and making things difficult for local residents. Even worse, tourists have trampled the foliage around the pools, ruining their pristine beauty. The situation was so bad, we saw the crowds and immediately left. Fortunately, there are several hidden Fairy Pools you won’t find on any map. Arron told us about two, and our AirBnB hosts told us about another. Not only are these pools in much better condition, but we didn’t see a single other tourist during the entire time we were there. We’re not going to spoil the secret, because we don’t want to contribute to the problem. But if you get to know some of the locals on Skye, they might just share insider info on where you can find a Fairy Pool all to yourself! 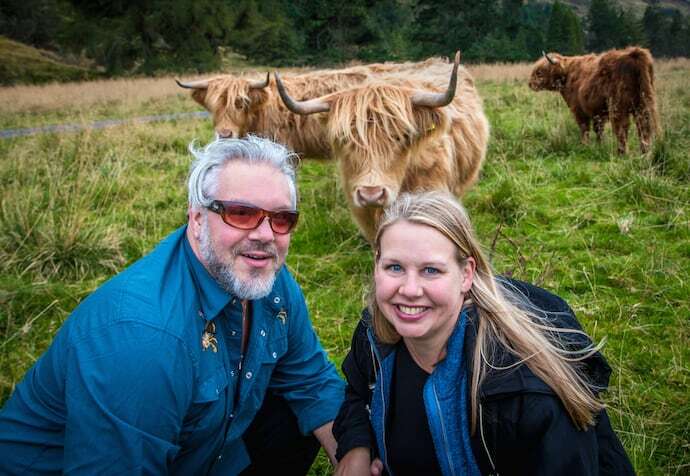 If the Scottish islands had a mascot, it would be the “Hairy Coo” (an affectionate nickname for Highland cattle). Hanging out with and photographing them was definitely one of our favorite things to do on the Isle of Skye. These long-haired, long-horned cuties are a hardy breed that has been bred in western Scotland since at least the 6th century. 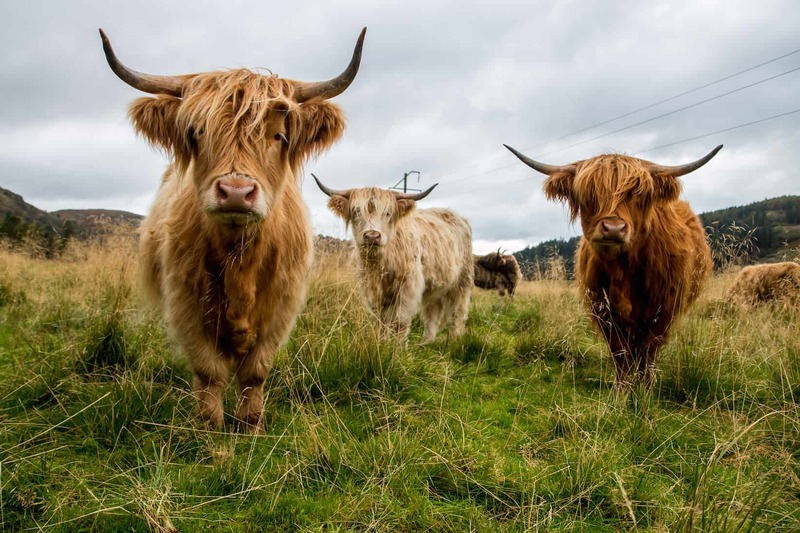 You’ll see them frequently alongside the road when traveling through the Highlands, in colors running the gamut from red, yellow, white, and silver to black and brindle. Hairy Coos are mostly bred for their meat and milk. They have a double coat that makes them well-suited to the wet, windy weather conditions for which the Isle of Skye is known. They’re known for their docile temperament, which became clear as soon as Arron parked our van next to his favorite fold (a.k.a. herd). Rather than running away, the cows watched calmly as our group gathered. Arron walked over and knelt down, and one cow actually rubbed her forehead against him. Several let us hand-feed them some of the grass upon which they were grazing. Just after the photo above was taken, one snuck up behind me and rubbed herself right against my backside. I guess she could sense that we always like to make friends with the locals! Some travelers pooh-pooh group tours, preferring to travel independently and explore a destination on their own. But we love the insight into local history, culture, and customs a great guide like Arron can give. And they always know the best place to get a stunning shot. The Cuillin (a.k.a. the Black Cuillin) is a rocky mountain range that dominates the Isle of Skye’s dynamic landscape. The highest point, Sgurr Alasdair, looms at 3,255 feet above sea level. The second highest, Sgùrr Dearg, boasts a 150-long “Inaccessible Pinnacle” that makes it a favorite among rock climbers. 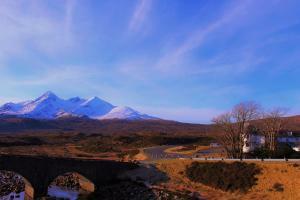 The most popular place to see the mountains is from the Sligachan Bridge. We visited in the morning, when few people were there. Most were standing on a hill, with the bridge in the foreground and the Black Cuillin behind. But Arron suggested we go under the bridge, where the framing was much better from a compositional standpoint. According to local legend, the waters beneath the bridge are imbued with magical powers. Stories tell of an ancient Scottish warrior woman, Scáthach, who battled Ireland’s greatest warrior, Cúchulainn. Frightened by their vicious fighting, Scáthach’s daughter went down to the river and wept. The faeries heard her and told her to wash her face in the river, which would give her the wisdom she needed to end the battle. Today it is said that anyone who washes their face in the river’s chilly waters will be granted the gift of eternal beauty. So of course Mary tried it, and she’s never looked more gorgeous to me! One of our favorite aspects of Arron’s colorful character was his use of the word “wee” to describe things that were anything but. The Black Cuillin hills were a “wee” mountain. The “wee” pizza he ordered for dinner in Portree was larger than my car’s hubcaps. So when he suggested we stop for a “wee” nip at the Talisker Distillery before I’d even had my second cup of coffee, I was equally game and concerned. I know how Scots love their Scotch! But morning ultimately proved the best time to visit, as it grew more crowded later in the day. Unfortunately our itinerary didn’t leave time for a full tour of the distillery. 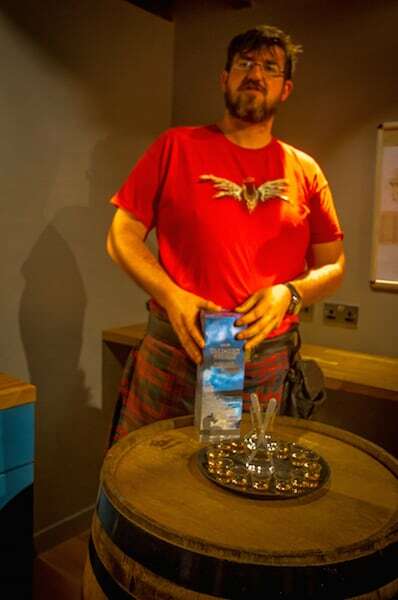 But Arron arranged for us to have a tasting of their award-winning whiskies, which have been named Best Single Malt Scotch in numerous international competitions. The flavors were bold and rich, with a smokey intensity and an undercurrent of peat. Talisker whiskey is made with water that comes from springs directly above the distillery, in worm tub stills designed to replicate the early 19th century originals. In short, it’s a delicious taste of Scottish tradition that every Skye visitor should sample. The Trotternish circuit– a 50-mile loop around Skye’s northernmost peninsula– is the island’s most heavily-trafficked tourist area. Cruise ship passengers often disembark in Portree, take a 2-hour or half-day tour, then get back on the boat and head to their next destination. Fortunately, Arron seemed to dislike crowds and congestion as much as we do. So while most of the tour buses head north from Portree in the morning, we headed west. By the time we made it to Kilt Rock in the late afternoon, most of the other tourists were long gone. 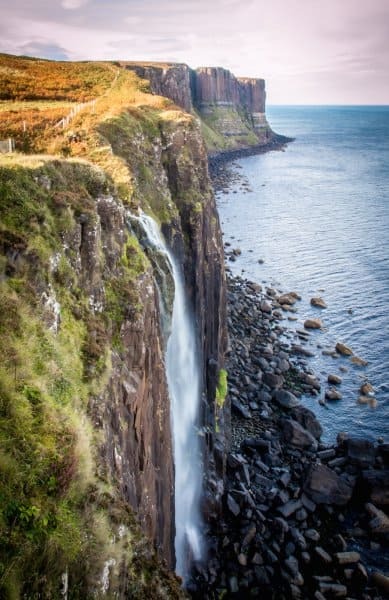 Towering nearly 300 feet above the crashing surf of the Atlantic Ocean, Kilt Rock is made up of basalt columns resting atop a base of sandstone. From a distance it looks a bit like a pleated kilt, with the colors of the rock creating a tartan-like illusion in the sun. The overlook also provides a killer view of Mealt Falls, which plummets down onto the jagged rocks below. Visiting after the crowds have dissipated provides an unexpected bonus. When a strong wind blows (which, on Skye, it often does), you can hear a haunting, ethereal tone all around you. This comes from holes in the fencing, which turn the safety rail into an eerie organ powered by the elements. My interest in the Isle of Skye originated in my attempts to trace my family history. The Loves were a sept of Clan Mackinnon, one of the seven original Highland clans who descended from Alpin (father of the man widely considered the first King of Scots). The Mackinnons were among the most powerful clans in the Scottish Highlands, with seats of power on the Hebridian islands of Iona, Mull and Skye. They were closely aligned with Clan Donald (or MacDonald), whose chiefs historically held the title of Lord of the Isles until 1493. 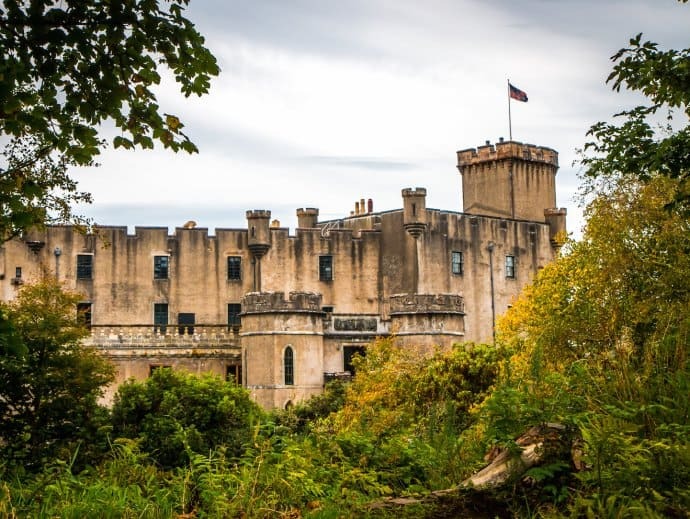 Located on Skye’s remote, southeastern Sleat Peninsula, Armadale Castle is considered the spiritual home of Clan Donald. A country mansion house was built in 1790, then the Scottish baronial-style castle was added in 1815. The castle was abandoned by the MacDonalds in 1925, but their 20,000-acre estate well worth visiting today. There’s also an impressive Museum Library with a focus on genealogy, which proved very helpful in researching my family history. Their collection includes books on clan histories, census reports, a database of records of several thousand Skye families, and more. There are even experienced researchers on staff to help, with a small donation suggested. 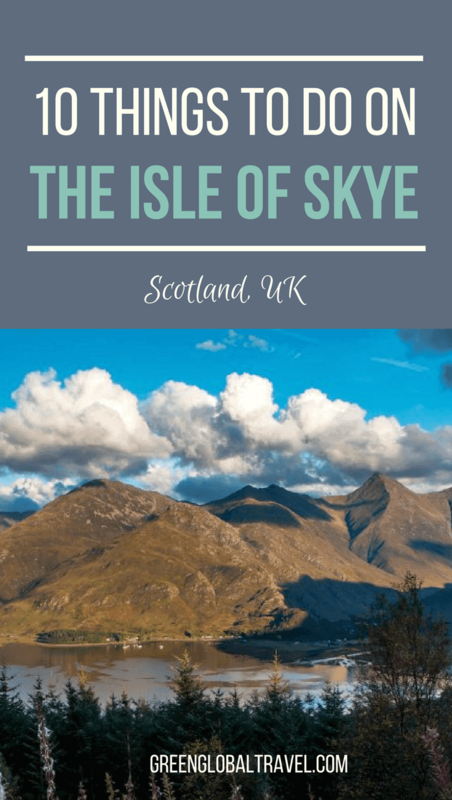 This is another one of those incredible things to do on Skye that we never would’ve known about if we hadn’t traveled with Rabbie’s. We knew we were in for a treat when Arron told us he had a special surprise in store. Arron loved to play dramatic music as we approached a spectacular view, so that the crescendo was perfectly timed to our arrival. When he had to reverse on the single-track Ratagan Pass to make room for an oncoming truck, he actually rewound the song. 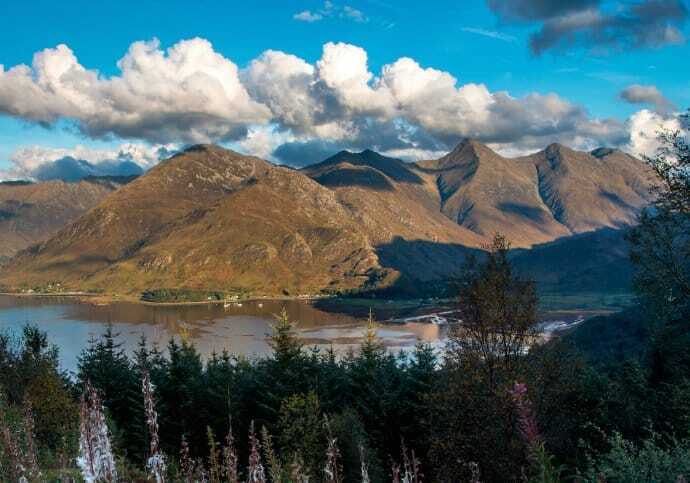 The effect when we finally rounded a curve and saw the Five Sisters of Kintail unveiled was absolutely jaw-dropping. It was late afternoon, and we had the tiny car park all to ourselves. Like all the best Skye attractions, the mountains come with a bit of folklore attached. The story goes that the two most beautiful of seven sisters were married by Irish brothers, who swore that their other brothers would return to wed the rest. When they didn’t come, the sisters asked a witch to ensure they’d retain their beauty until their suitors arrived. She did so by turning them to stone. Today the five peaks remain as gorgeous as ever, standing shoulder to shoulder as if gazing out to sea, longingly awaiting the love they were promised. Along with Doune Castle, the Quiraing is one of the most famous filming locations in Scotland. The striking landscape has been featured in films ranging from Stardust and Snow White & the Huntsman to 2017’s King Arthur and Transformers: The Last Knight. It’s easy to see why the area has gotten so much attention. The Trotternish Ridge escarpment was formed by a series of landslides. 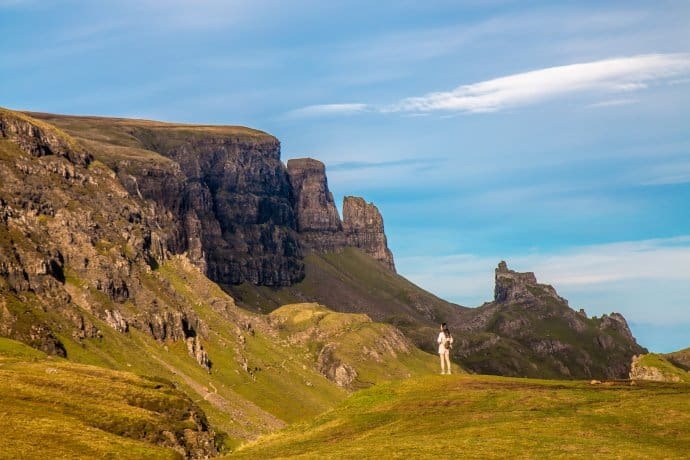 The Quiraing– the eastern face of the northernmost summit– is the only part that’s still moving. So much so that the road at its base has to be repaired every year! As a result, the geological formations that remain have an almost alien appeal. Many have nicknames, including The Needle (a 121-foot pinnacle), The Prison (a pyramid-shaped peak that some say resembles a medieval keep), and The Table (a flat grassy area). The vistas that surround the Quiraing are stunning, and arguably among the most verdant on the Isle of Skye. 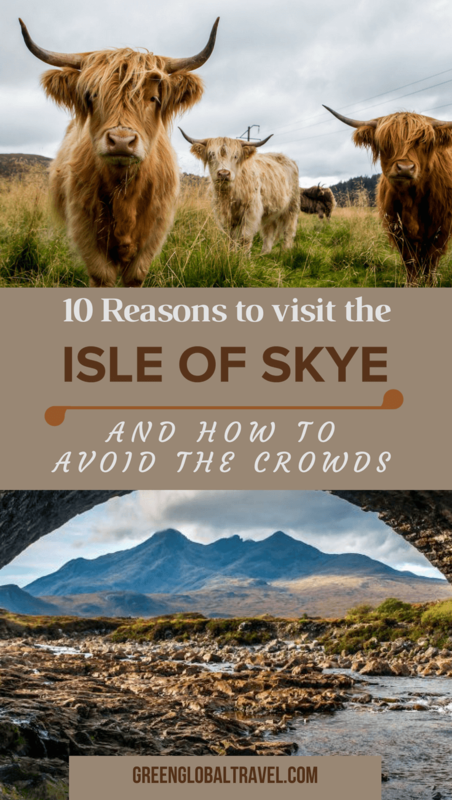 The only downside is the fact that this is arguably the most popular place to visit on the Isle of Skye. Though we visited in late afternoon, there were still cars and tour buses lining the road. And since we were already short on time, we didn’t stay very long. But if you’ve got a morning or late afternoon free, it’s a great place to go for a hike, take a picnic, or simply sit and soak in the beauty the area has to offer. Easily the most impressive of all the castles on the Isle of Skye, Dunvegan has been the seat of the chief of Clan MacLeod since the 13th century. Built on an elevated rock overlooking Loch Dunvegan, the castle is unique in that the family still lives there today. The castle was built in stages over the course of many years. A 4-story tower house was built in the late 14th century, with a “Fairy Tower” built around 1500. A range of buildings were added between them in the 17th century, and in the 19th century the whole thing was remodelled in a mock-medieval style. 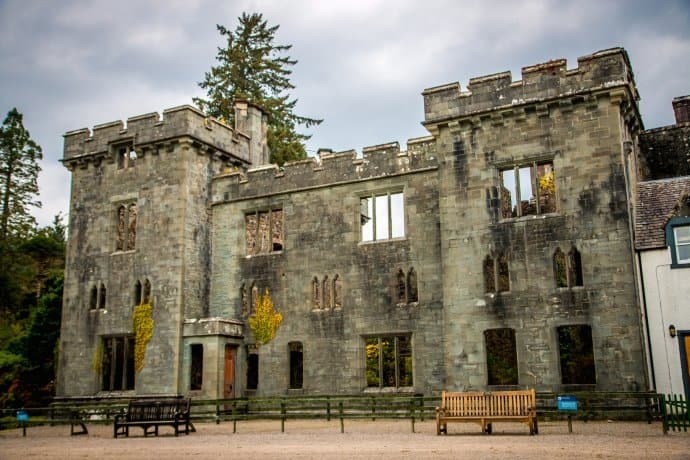 Where Scottish castles such as Inveraray and Edinburgh feel like museums, touring Dunvegan feels strange because you’re always conscious of being in someone else’s home. Signs make it clear visitors aren’t allowed to touch the bed, and certain parts of the castle are marked as off-limits to guests. The castle’s historic collection is quite impressive. Its priceless heirlooms include the Dunvegan Cup (which dates back to 1493), the Fairy Flag (which was believed to be imbued with magical powers), and Sir Rory Mor’s Horn (a ceremonial drinking horn thought to be over 500 years old). 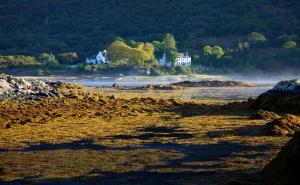 Kinloch Lodge is a family-run historic hotel with a Michelin-starred restaurant. It’s located across Loch na Dal, far away from tourist crowds. Let chef Marcello Tully amaze your tastebuds with an unforgettable meal, or bespoke cooking classes. Formerly a hunting lodge for Clan MacDonald, it’s the perfect place to enjoy a roaring fire, a warm welcome, and surrounding nature. Check Rates or Read Reviews. Set on 15 acres overlooking Portree Bay and the majestic Cuillin Mountains, the Cuillin Hills Hotel is a comfortable, finely decorated manor. Rooms are spacious, and those with bay views see the waters change color at sunrise and sunset. 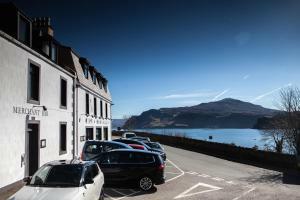 Located less than a 10-minute walk from the center of Portree, travelers can enjoy the local shops in addition to the stunning scenery. Check Rates or Read Reviews. The Sligachan Hotel is a rare gem for nature travelers, offering a convenient location, good food, and stunning views at an affordable price. 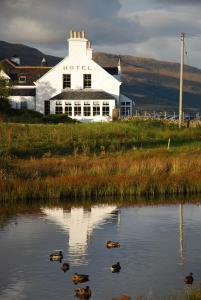 Situated at the foot of the Cuillins, the Sligachan Hotel is perfect for hikers and nature lovers. The basic rooms are clean, and have all of the necessities (including nice toiletries). With a focus on the fundamentals, don’t expect much from Wifi: This hotel is all about the unspoilt surroundings! Check Rates or Read Reviews. Portree’s Bosville Hotel is comfortable, well-maintained, and within easy walking distance of shops and restaurants. The helpful staff is happy to pack up breakfast for those on the go, or you can enjoy a more leisurely on-site breakfast. There are some larger rooms with fantastic views of the harbour. While staying in Portree is convenient, be aware that the streets can get congested and parking can be a problem. Check Rates or Read Reviews. Located in a quiet little corner of the Sleat Peninsula right beside the water, Hotel Eilean Iarmain was voted the #1 Best Value on Skye by TripAdvisor. The hotel’s comfortable rooms are spacious, and there are special prices available for winter rates. The hotel offers a welcoming lounge with a roaring fire and and adjoining bar that has good food and a friendly atmosphere. All in all, it’s a perfect place for a cozy Gaelic getaway. Check Rates or Read Reviews.